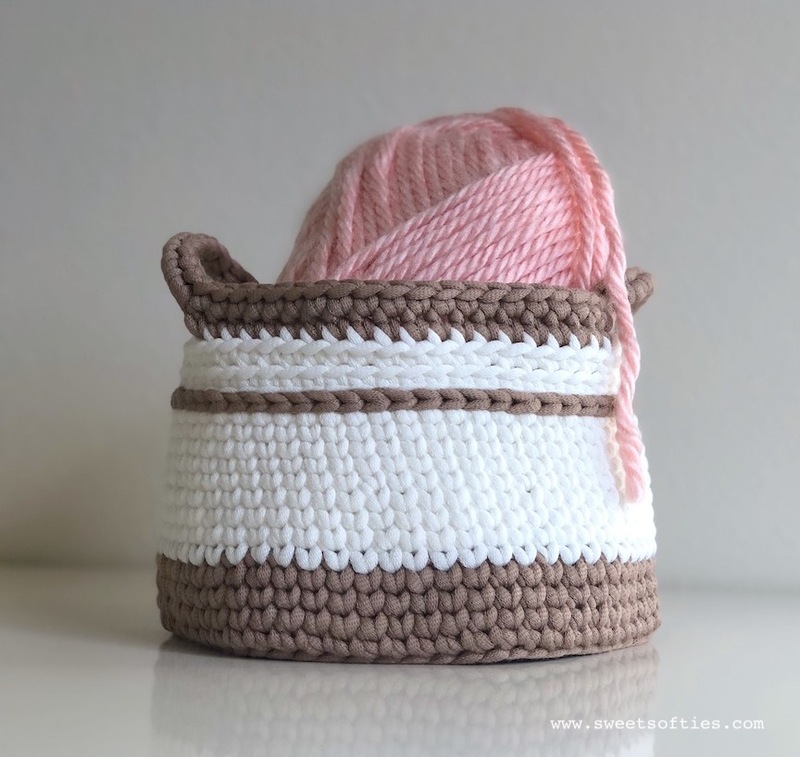 As an extension of my post about the Knit Stitch Basket (free crochet pattern), I've decided to share another basket creation of mine! This one has base that is similar to the Knit Stitch Basket, but I've added some additional texture and variations in stitching to make it look more interesting! Below is a side-by-side visual comparison of the two. For this textured basket, I used 'Bernat Maker Outdoor' yarn. It's a bulky, weight 5 yarn that is essentially a chainette tube filled with polyester stuffing. That makes it super unique compared to most other yarns I've used, and it's so fun to work with! What's nice about this yarn is that it's also machine washable for easy care. For this basket in particular, I used the two colors 'Fresh White' and 'Sandy Beach'. A nice and clean color combination, I believe! 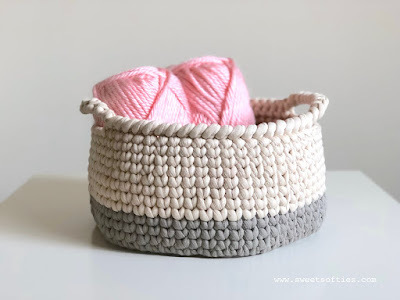 If you'd like to make one of these baskets for yourself, please check out my pattern below! 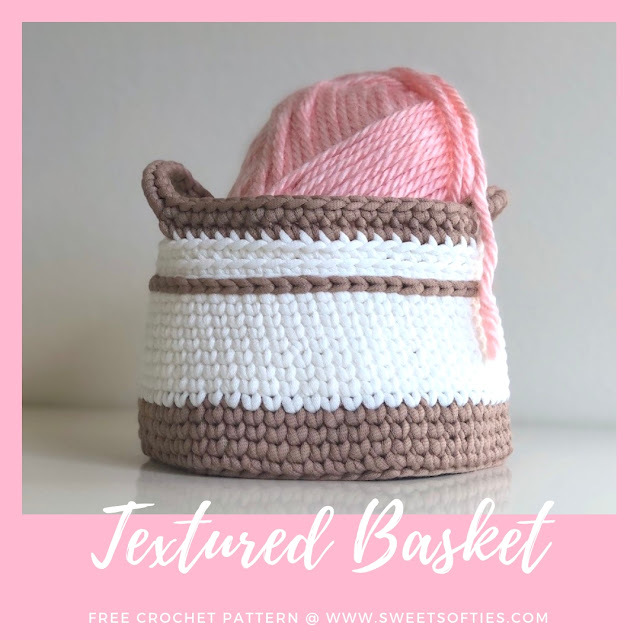 The Textured Basket pattern provides easy instructions for crocheting a simple, chic, and functional basket featuring various crochet stitches and techniques, including the single crochet, slip stitch, crocheting in back loops only, and the knit stitch. This basket is relatively quick to work up, yet maintains a lovely look. While it is a beginner-friendly crochet pattern with video tutorials and photo references, there are many ways to customize it to give it a unique and special look! For example, play with different yarn colors, or add embellishments (e.g., buttons, flowers, bows) to make it the perfect, personalized item for your home or as a gift to a cherished one! Familiar Beginner. Requires knowledge of or willingness to learn the stitches used (below) and changing colors. The base of the basket is done in single crochet, while the sides are done in knit stitch. The pattern is written for the entire basket to be worked in a continuous spiral, meaning the rounds are not joined. However, if you would like to join rounds, you may do so by adding a "ch 1" to the beginning of each round and finishing with a "slip stitch to join to the first stitch" at the end of each round. Start with the bottom yarn color (brown). Continue in the bottom yarn color (brown). R27: In BLO, sc 10. Ch 10 and skip 10 sts. Then, sc 20. Ch 10 and skip 10 sts. Then, sc 10. Note: When you come to the handles (ch-10 space), insert 10 sc in the space. Congratulations on finishing the "Textured Basket" pattern! For those who are interested in adding personal details or embellishments to this basket, here are some ideas! You can sew on embellishments or appliques, such as tassels, pom-poms, buttons, bows, crocheted flowers, or more. Use your creativity to make your basket unique! Then, fill it up with whatever you'd like! Remember, if you'd like to try out the Knit Stitch Basket (free crochet pattern), click on the image below to navigate to the pattern page! 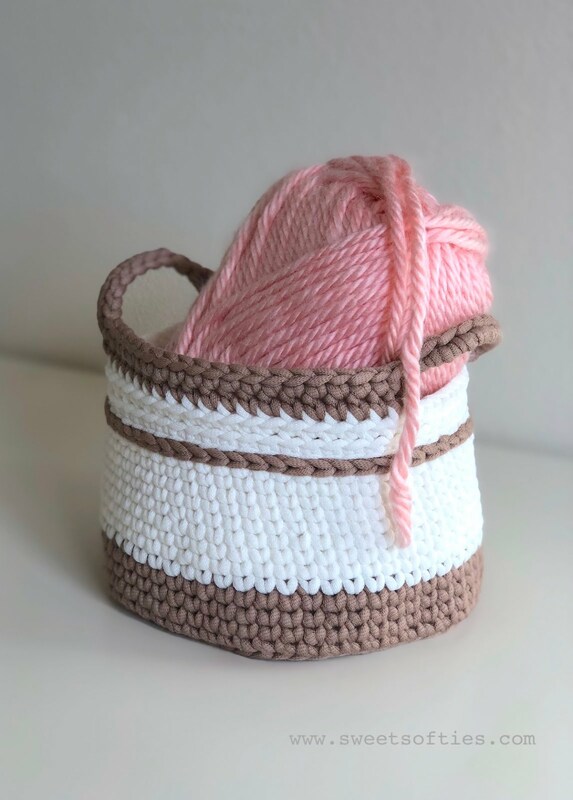 Or, if you'd like to try your hand at an extra-large and ombre-colored basket that is perfect for storage and organization of larger objects, try the Blue Coast Basket (free crochet pattern)! I like your basket, but I've got a question. In the materials list it says you need a 6mm hook for the project. Is this correct? 6mm is a J hook. When I went to the video tutorial on how to make the knit/sc st it looked like you were using a larger hook than a J/6mm. Hi Leah, thank you for asking! For the Textured Basket pattern on this page (the one you're inquiring about), I did use a 6mm (J) hook. The yarn is bulky weight (5) yarn. 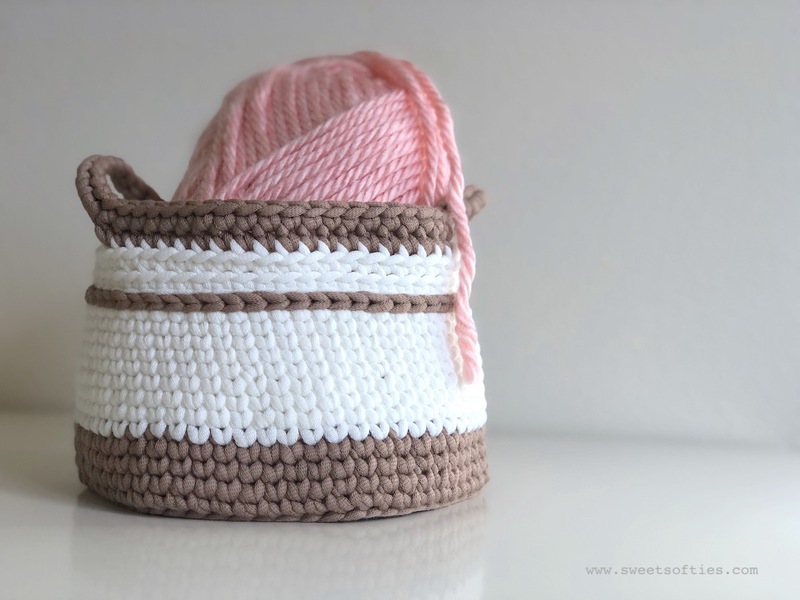 In the Youtube video you saw, I was demonstrating the knit stitch with a different type of yarn and hook, and that is for my Knit Stitch Basket pattern (https://www.sweetsofties.com/2018/10/knit-stitch-basket-free-crochet-pattern.html). For that pattern, I was indeed using a larger hook (9mm), because I was also using a bulkier yarn: Jumbo weight (7) yarn. If you are planning to use bulky weight (5) yarn, I recommend using the 6mm hook as stated. I hope that this is helpful! Let me know if you have any other questions, thank you! Thank you for your kind reply. I didn't realize it was two different projects. Also thank you for sharing your pattern.